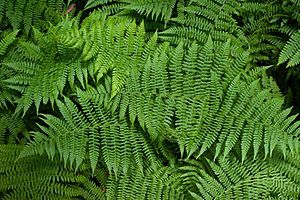 Ferns do not have waxes or special cells on their surface that keep water from evaporating. They have roots, stems, leaves. Their stems may form runners, called stolons above the ground, or rhizomes below ground. The leaves are green an large, and may bear spores on the underside. Some ferns can grow large in moist places. They can survive in more places than moss, but not so many as flowering plants. Many ferns depend on associations with mycorrhizal fungi. Many ferns only grow within specific pH ranges; for instance, the climbing fern (Lygodium palmatum) of eastern North America will only grow in moist, intensely acid soils, while the bulblet bladder fern (Cystopteris bulbifera), with an overlapping range, is only found on limestone. 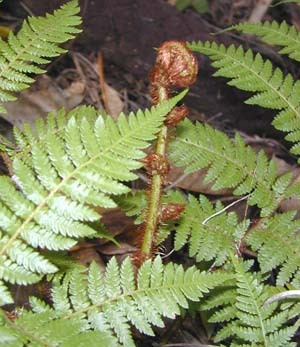 Ferns are vascular plants differing from lycophytes by having true leaves (megaphylls), which are often pinnate. They differ from seed plants (gymnosperms and angiosperms) in their mode of reproduction—lacking flowers and seeds. Like all land plants, they have a life cycle referred to as alternation of generations, characterized by alternating diploid sporophytic and haploid gametophytic phases. The diploid sporophyte has 2n paired chromosomes, where n varies from species to species. The haploid gametophyte has n unpaired chromosomes, i.e. half the number of the sporophyte. 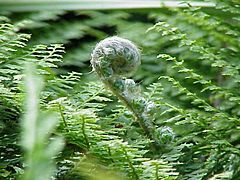 The gametophyte of ferns is a free-living organism, whereas the gametophyte of the gymnosperms and angiosperms is dependent on the sporophyte. A spore grows into a haploid gametophyte by mitosis (a process of cell division which maintains the number of chromosomes). The gametophyte typically consists of a photosynthetic prothallus. The fertilized egg is now a diploid zygote and grows by mitosis into a diploid sporophyte (the typical "fern" plant). Fern Facts for Kids. Kiddle Encyclopedia.